“We are delighted to be working with the Ocean Discovery Institute to support their youth STEM initiatives in City Heights. We strongly believe in supporting STEM and science education for students and recognize that today’s children are tomorrow’s future." 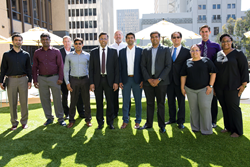 Zensar, a leading digital solutions and technology services company that specializes in partnering with global organizations across industries on their Digital transformation journey, has partnered with the Ocean Discovery Institute (ODI) to help fund STEM initiatives in the San Diego region. Zensar attended a ceremony on July 23rd, 2018 to present the Ocean Discovery Institute with a check to support their initiatives in City Heights. The reception provided an opportunity for the students of ODI to engage with Zensar engineers and learn more about careers in technology. Officials from the City of San Diego in attendance, included Council Member Barbara Bry, Deputy Chief of Staff to Mayor Kevin Faulconer, Felipe Monroig and Council Representative from the Office of Council Member Georgette Gomez, Kelvin Barrios. Future programs between Zensar and the Ocean Discovery Institute include a STEM job shadowing initiative where students from the institute partner with Zensar’s technology associates to learn more about career paths in technology and experience a day in the life of Zensar’s technology focused associates.